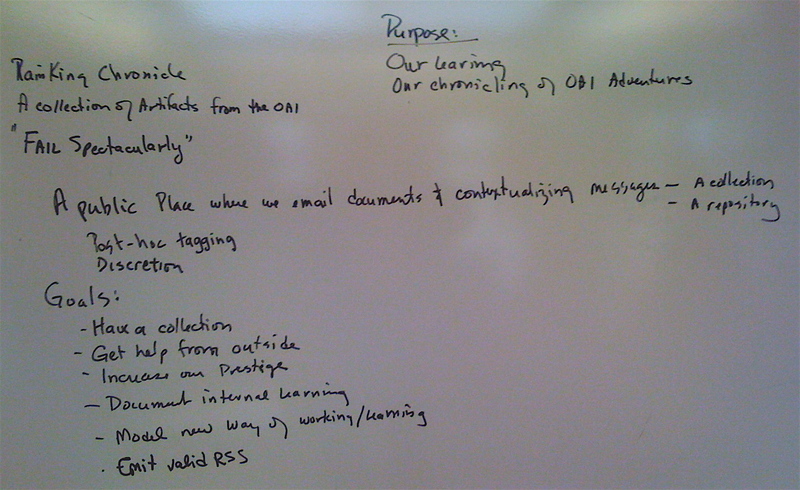 On Oct 16, 2009 at an OAI staff meeting, this whiteboard image was created to describe our vision of the RainKing Chronicles The Chronicles were implemented in SharePoint allowing email to be cc:ed to them (an idea we learned from Margo Tamez’ portfolio work). Limitations of SharePoint meant that we needed to go and post-tag items. With the disbanding of the team that did the work chronicled the materials were (mostly) exported to the RKChronicle tag in this blog. by Alexander C. McCormick (Director of NSSE at Indiana, Bloomington), pp. 35-43. “But transparency can be about more than consumer information. It can provide an opportunity for a college or university to proclaim its success while acknowledging that it needs to improve in some areas” (36). “For internal audiences, this kind of information focuses attention and signals priorities for improvement, while for external observers it offers evidence that the academy takes its education mission seriously and practices what it preaches regarding the use of evidence to support assertions, interpretations, conclusions and prescriptions for action” (36). “Such openness is risky for several reasons, though. Revealing shortcomings invites negative consequences, whether from a legislature that may be seeking ways to cut budgets or to demonstrate hard-nosed commitment to quality, from competitors seeking to exploit vulnerabilities, from alumni or other constituents on the lookout for evidence of a decline in standards, and so on” (36). “As a result, ‘transparency’ is sometimes a euphemism for what might be more accurately described as strategic communication or image management, in which information is carefully selected and presented so as to portray a successful and effective institution” (36). “This is a time of great sensitivity about inter-institutional comparisons that rises in some cases to comparison phobia” (42). “Now, let me propose two important ways that the transparency movement needs to be refocused. A significant challenge that lies ahead for transparency efforts, and indeed for the entire accountability movement, is the exclusive and potentially misleading focus on institution-level measures of central tendency” (43). The sooner we come to grips with the fact that variation in the student experience is far greater within institutions than between them and devise ways to represent and talk about this internal variability, the sooner we will focus on the real quality questions. In light of unacceptably low graduation rates and a new national focus on improving college completion, we need to shift much of the energy presently focused on comparing institutions to finding ways to improve the engagement and success of the least engaged students at every institution” (43). And finally, another imperative for accountability and transparency is to move from performance snapshots—point-estimates of student engagement and learning outcomes—to plans for improvement and results. Policy makers and the news media should be less concerned with where an institution falls in the performance distribution than with what the results signify and what is to be done about them. Rather than pressuring colleges and universities to disclose assessment scores, the emphasis should be on transparency regarding a different part of the assessment cycle: action plans and interventions, followed by careful evaluation of whether those interventions achieve the desired results” (43). I needed to migrate a SharePoint blog to hosted WordPress (this blog, category RKChronicle), and after a bit of searching assembled this solution: SharePoint to Excel, Excel to CSV file, CSV imported to WP (3rd party host), WP export to WP (hosted) import. SharePoint to MSExcel. Using Internet Explorer under Windows, in the SharePoint blog, use View All Site Content to access the Posts (a SharePoint list). When viewing the list use the Actions dropdown to Export to Excel. Save the resulting file. MSExcel to CSV. The importer I found requires Comma Separated Values, so open the file created above in Excel and “save as” into CSV format. The importer is smart, you can omit columns and it will set default values. SharePoint didn’t have some of the data the importer expected, so I omitted Post_type, post_excerpt, post_tags, and post_slug. I renamed the column headings from the Excel export (step above). The default columns expected by the importer and the ones I used (bold). I set the option “import posts as draft” so I could work with them privately. When the import worked, it worked quickly. When it didn’t it gave no useful error messages. I found that I needed to be very careful with the CSV file (first couple times I edited it on a Macintosh and that seemed to make it not work). There is a sample file. Play with it until you get your tool set right. I tried going via RSS, but was unable to see how to get a SharePoint blog RSS feed that contained the bodies (as opposed to linking them). WP wants to import an XML file not a feed and I could not find a way to get the necessary file from a SP feed. I mapped SharePoint Categories to WP tags for my own reasons. If you touch the CSV file by opening and saving using Excel for Macintosh, you will screw it up somehow. All work must be done on the PC. I found that I needed to convert some characters in the CSV file. I think SP must have used unicode for smart quotes and for carriage-return. I did a bulk replace on the CSV file to deal with most of the issues. The process did not move attachments and images. I did this by hand and also made minor clean up to the posts. Biggest annoyance. The process brought over the date posted but when I convert the drafts to published, the date is changed to the current date. Were I doing this again, I’d consider importing in published format (not draft) into an obscure instance of WP, do the editing, then export to the production WP. The table below charts the steps that Washington State University’s Office of Assessment and Innovation (OAI) and its stakeholders went through to develop the Guide to Effective Program Assessment rubric used in the WSU System of Student Learning Outcomes Assessment. Description Generalized Model Specific example of application at WSU’s Office of Assessment and Innovation. Determine the scope of the program assessment initiative. Solicit stakeholder input about the purpose of the assessment. Determine which aspects of program assessment will be most useful for the institution to assess Gary met with provosts and assistant deans to frame the general parameters. Develop a framework for assessing assessment at the meta-level. Research existing literature (and tools) to begin delineating rubric dimensions. Developed a framework for the rubric based on the WASC Evidence Guide, writings from Peter Ewell and others, and the Transformative Assessment Rubric, an EDUCAUSE Learning Initiative project to evaluate the responsiveness of assessment plans. 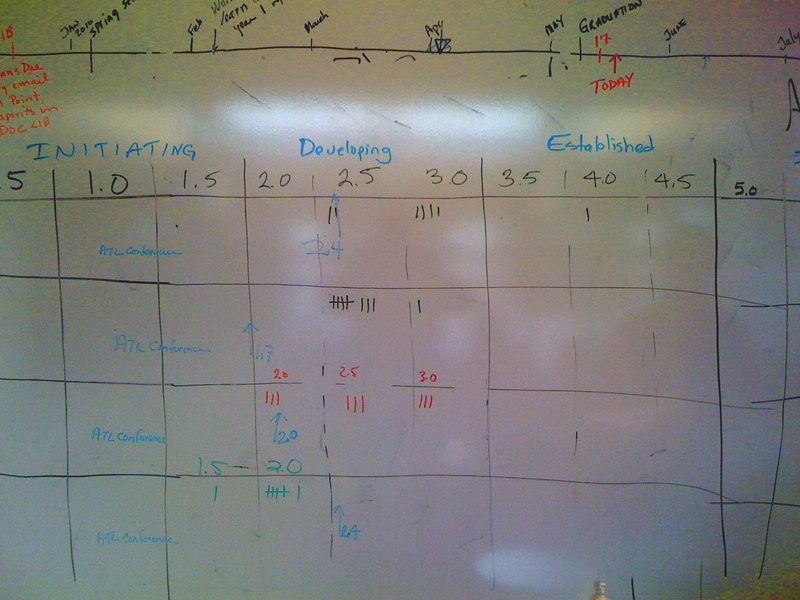 Test a draft rubric November 2009 Solicit program assessment plans for low-stakes review. Solicit a program’s report written for WSU’s 2009 NWCCU accreditation self-study and test the rubric with OAI and external reviewers. Revise rubric/ assessment process. February-March 2010 Solicit feedback from programs as well as reviewers about what worked and what didn’t. Revise rubric and assessment process to be more useful and efficient. 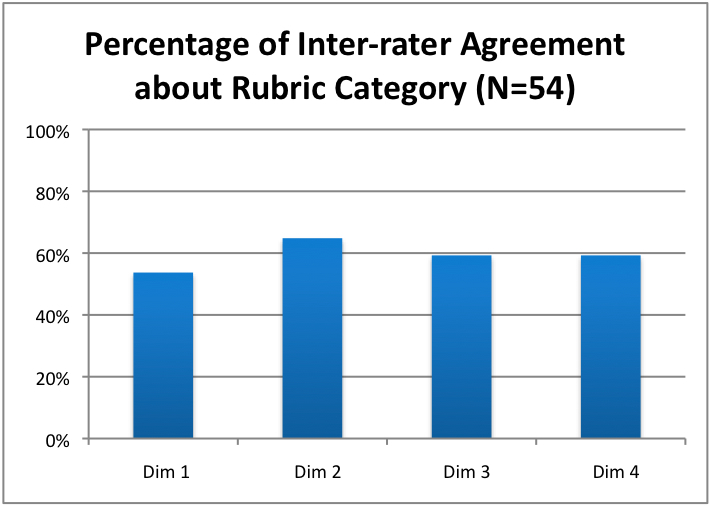 The rubric was revised based on feedback captured from notes reviewers made as they were using the rubric as well as feedback from programs via an online survey. Informal observations from programs to their OAI contacts were also included. The 4 dimensions remained essentially the same but number of levels, level names and wording of rubric criteria changed considerably. All wording was changed in a positive format (what was happening versus what was missing) and a definition of terms was added as a cover page. The 6 point scale remained the same. Test rubric April May 2010 Solicit feedback from stakeholders in the process of using the rubric on a sample report The revised rubric was tested internally by rating a report written for the December 2009 cycle. The rubric and report were also used by an audience at a regional assessment conference. Despite not norming together the internal and external reviewers agreed fairly closely. October – December 2010 Review quantitative and qualitative evidence of the review process Studies of interrater agreement were conducted along with collection of observations from using the rubric (The scoring tool had a place for reviewers to make comments about the rubric in the context of a specific rating effort.). These were used to begin framing the next revision of the rubric and template. 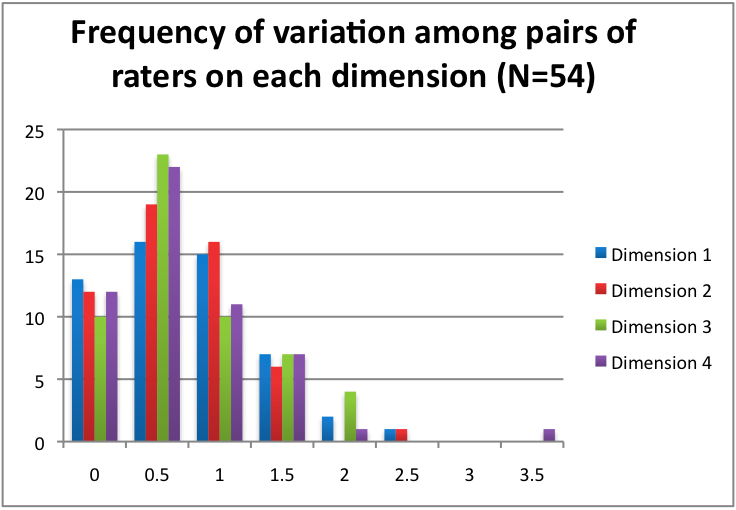 With the NWCCU report filed we turned to some assessment of our inter-rater reliability, viewing that as an opportunity to understand what might be differences in our shared understandings. These may be rubric elements or interpretations of rubric language. OAI has been finishing up its 2009-10 cycle of reviews of program-level assessment, see the University’s portfolio for details about the process and the results. Provides a reference point for students to consult repeatedly as they monitor their own learning and develop the skills of self-assessment. Students are supported in becoming better judges of quality in their own and others’ work. Supports the development of a sense of shared expectations among students, faculty, staff, and external stakeholders. Provides evaluators and those whose work is being evaluated with rich and detailed descriptions of what is being learned and what is not by facilitating a breaking down of outcomes into dimensions and of dimensions into criteria. Provides criteria to shape and guide students’ engagement with one another and with course content. Promotes a shared understanding among faculty, students, and stakeholders of the program outcomes.